If the process is implemented in BPMS then we may count on BAM (Business Activity Monitoring) - dynamic reports first displaying a bird’s-eye view of the process system then a detailed view by drilling-down up to a single process instance. Besides the system will likely provide automatic notifications about task assignation, expiration and withdrawal that will be sent by email to the performer or his/her boss (or rather both of them). If the process is executed without BPMS then control would consume manager’s intellectual resources - meetings, phone calls, verbal communications… By the way getting rid of this headache is another, oftenly underestimated BPMS effects. Anyway, this kind of control belongs rather to task management than to process management. After all, tasks may come not only from process but also from projects, ERP, cases or just ad-hoc. The options are many, but it’s always about standard vs. actual durations control. To be consistent we should hook up every real task with a timer and a control task. Would it please you? Not me, for sure. 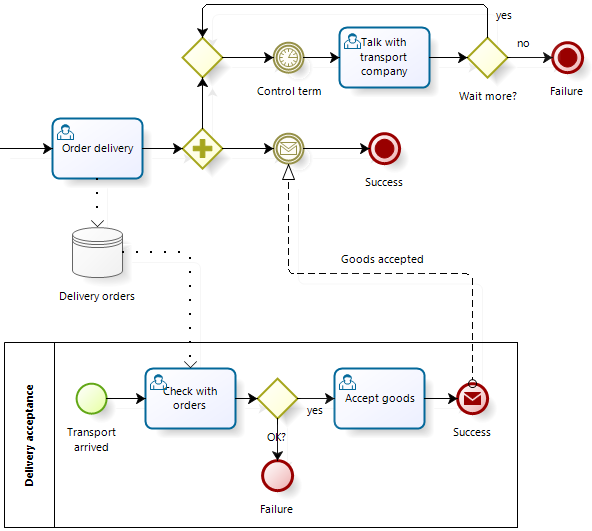 Therefore I prefer to associate this kind of control with task management, not processes management. What if a task is overdue? Let’s just assume there is some kind of a control system so a manager becomes aware of it and takes appropriate actions. 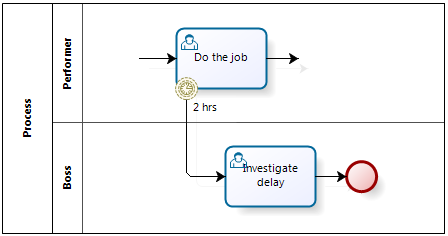 To achieve this, we just specify the standard duration in the task attributes but don’t draw anything at the diagram. By the way the overdue isn’t a crime. If we set up a standard duration equal to the mean value of the duration statistical distribution then it’d happen in about 50% cases (assuming that the distribution is close to the normal). It won’t mean the performer’s fault - just the tight standard duration. It’s better than setting a relaxed duration. 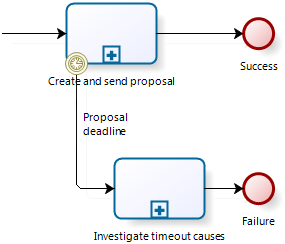 So use BPMN timers only when some non-trivial action (other than routine duration control) is needed. Судя по схеме, если груз не пришел в установленный срок, процесс обречён на неудачу. Почему же “обречен”? А развилка “ждем еще”?